In a stroke of programming bravado, Colorado Ballet Artistic Director Martin Fredmann has chosen three classic American ballets for the winter program, each with its own set of demands, giving his company the opportunity to satisfy a variety of tastes while once again displaying the depth of talent he has assembled. In addition to these stylistic and technical considerations, the three pieces, Agnes de Mille's Rodeo, George Balanchine's Rubies, and Martin Fredmann's own A Little Love, fit with the upcoming Valentine's Day celebration. Opening the evening, bright shades of red and a jazzy blend of modern and classical movements are central energies in Rubies, a section of Balanchine's full-length Jewels. Set to Igor Stravinsky's Capricco for Piano and Orchestra, the quick, sassy choreography reminds us of light refractions from the gemstone itself. As the second movement turns inward, we are treated a moving pas de deux by Maria Mosina and Igor Vassin. Next, after what must be described as a crystallization of dancers, Janelle Cook delivers an energetic solo. 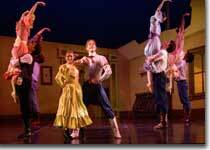 Then, in a final, glittering burst of color and athleticism, a series of 20th Century dances flash before us. Rubies, performed as part of the celebration of 100th anniversary of Balanchine's birth, is staged by Bart Cook, a former principal dancer in Balanchine's New York City Ballet, later appointed assistant ballet master to Jerome Robbins by Balanchine. Cook now works for both the Balanchine and Robbins trusts. A Little Love, set to five songs sung by the late Nina Simone, follows the first intermission. On any other occasion, such a sentimental piece might seem dated, but given the season, the love ballads are both poignant and romantic, allowing us to revisit a less jaundiced time, when interpersonal exploration and introspection were encouraged. After the initial movement examining coupling, the dance touches on intergenerational connection, then evolves into a story of mature love and change, beautifully rendered by Maria Mosina and Hua Zhuang, followed by a time of remembrance, and finally, a celebration of love. The evening concludes with the headlining piece, Rodeo, staged by Paul Sutherland, who first danced the ballet in 1957 for the American Ballet Theatre under Agnes de Mille's direction, and has become one of its leading experts. Set to Aaron Copeland's lively score written expressly for de Mille, the dance and music tell the story of a tomboy cowgirl who enjoys the camaraderie and admiration of her male counterparts by day, but is ignored when it comes time for socializing and wooing. The evening of this performance, Sharon Wehner plays the cowgirl with youthful abandon, whiplashing as she breaks broncos, wilting with disappointment when she is passed over by the cowpokes, and reinvigorated when she discovers how to market herself as a woman. Chauncey Parsons matches Wehner's exuberance as her eventual beau. The costumes of cowboy hats, denim, and boots (true to de Mille's original design) are delightful, as are the bow-legged swaggers, the square dance, and the eventual good-natured set-to over the cowgirl's affections. 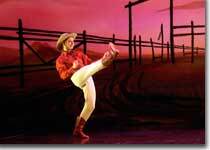 The Colorado Ballet's three-in-one, Rodeo, Rubies, and A Little Love runs through February 29th at the Paramount Theatre. 303-357-2787.